UPDATE. The JKAAF did very well at the competition, winning the women's individual kumite and kata events (Ray) and the men's kumite (Devin) and Kata (Lane) events. Ray was named the outstanding female competitor and Lane was named the outstanding male competitor. Our region won men's team kata and kumite and women's team kata amd kumite. It was pretty much a clean sweep of the tournament. Our Acadiana competitor who competed on Sunday did excellent. Lane Nevils won the silver medal in men's sparring, the gold medal in men's kata, and two gold other medals for team kata and kumite (as well as the overall best male competitor award). Holly Damico won a gold medal for women's team sparring. Soon Yeoh won two gold medals for men's team kata and kumite. Candis Durand won two gold medals for women's team kata and kumite. 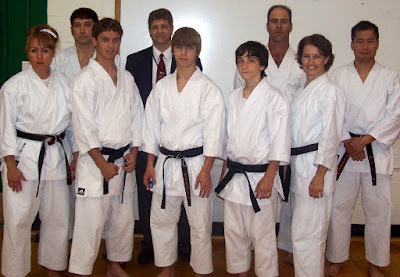 The U.S. team trials were then held between tournament winners and Mr. Mori's competitor's from the SKDI. Having not competed in the tournament, the SKDI competitors were definitely in an advantageous position in the team trial competition. In addition to that, they were very strong at Karate. From the JKAAF organization, Candis, Ray, and Rachel competed on the women's side. Devin, Tony Nakamura, Lane, Dimitri and Soon competed on the men's side. Everyone did kata and fought very well and with great spirit. In the end, from our organization, Ray, Devin, Tony and Lane were named to the United States team that will be competing in Tokyo in 2009 for the world championships. Congratulations to everyone on a very successful tournament. NATIONALS UPDATE. Just a quick note to let everyone know how NIKI is doing at the nationals. First, Tampa is really very nice and everyone is having a good time. Our region and our dojo is very well represented. 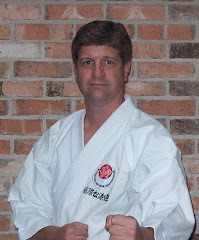 Sempai's Chad and Chase Norris competed in Kumite and Kata and both fought very well in very large divisions. Sempai Candis Durand took third place in women's Kumite in a very tough division and is now scheduled to participate in the team trials for a place on the U.S. team going to Japan's Shotocup in 2009. She will also participate in women's team kata and women's team sparring in the finals tomorrow (further updates will be given then). Cody Sedlitsky took second (silver medal) in Advanced Youth Kata. Jon Decuir took third (bronze) place in men's collegiate kumite competing for LSU. Sensei Scott has been refereeing and acting as a tournament official throughout the day. From our neighboring club, Holly is still competing in the women's team kumite event. Lane Nevils is in the top two men's Kumite finalist (the finals will be tomorrow) and he will be facing Devin Fadaol from New Orleans. Lane is also in the finals for men's Kata, men's team kata, and men's team kumite. Basically, Lane won everything. Soon also made the top four in men's kata and is still competing in men's team kata and kumite tomorrow. Overall, the Southern region (or the JKAAF as we are now called) has mopped up in the many divisions entered and our Acadiana area has done very well for the region.